(l-r) Liam Neeson as Michael and Olivia Wilde as Anna in THIRD PERSON. ©SONY PICTURES CLASSICS. CR: Maria Marin. 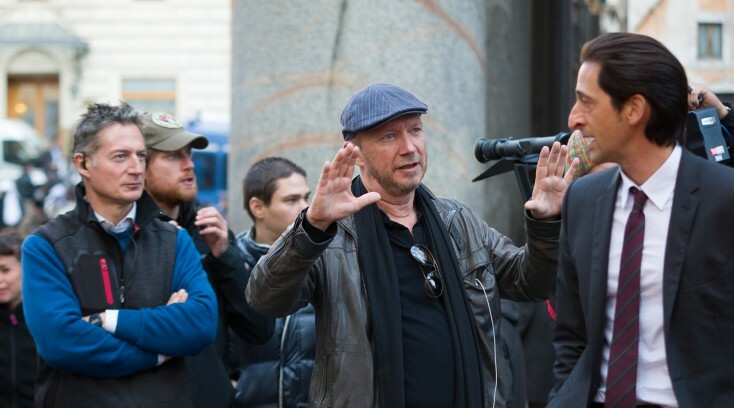 HOLLYWOOD—Paul Haggis has established himself as one of the most successful and in-demand screenwriters in town. He was the first screenwriter to win Oscars two years in a row with 2004’s “Million Dollar Baby,” directed by Clint Eastwood, and 2005’s “Crash,” which he directed himself. The main story centers on a successful novelist (Neeson, again) who has holed himself up in a suite to complete his latest book. Having recently left his wife (Kim Basinger) and is having a tempestuous affair with an aspiring young writer (“House’s” Olivia Wilde). Meantime, two other story lines—one involving a shady American businessman who meets a gypsy in Italy, and another involving a former actress struggling to regain custody of her young son from her wealthy, unyielding ex-husband. Adrien Brody, James Franco, Mila Kunis and Maria Bello also star. The stories converge in a way that only Haggis can design. After scarfing down half a sandwich between interviews, the 61-year-old filmmaker sits down to talk in a Beverly Hills hotel suite about his latest project, one that he feels closest to. He, in fact, dedicated the film to his 90-year-old father, who encouraged him to pursue his dream of becoming a storyteller when he was a young man. Q: It took you a while to complete this script? What was the toughest part to get? Haggis: The toughest thing for me was allowing the characters to take me where they wanted to go, which is what Liam’s character does. This one I wanted to write from the inside out. I wanted to allow them the freedom to do that. In doing so, I started telling my own story, not just theirs. It’s not that I meant to. There’s a great quote from (Albert) Camus that said, “A guilty conscience needs to confess. A work of art is a confession.” I can’t claim this to be a work of art, but it is certainly as close to a confession as you’ll see from me. Q: What are you confessing? Haggis: There are many questions. In fact, there are more questions than statements in this. I was really curious about the nature of love and relationships. The older I get, the less I understand. It’s also about how to deal with somebody. I’m an impossible person. So it’s about how to love someone who’s impossible, and do you try to change them? And if you do, are you changing them into someone you no longer love. Do you try to trust someone who’s completely untrustworthy? Do you believe someone even though your instincts are telling you not to. Do people become what we imbue them with? Do they rise to that? Q: I know there is a little bit of you is in each of your characters, but whom do you feel the most like in this film? Is it Liam’s character? Haggis: It’s hard because I put myself in each of the characters. Each of them are exploring something, the men and the women are each exploring something that I’m curious about. So it’s hard to say. Creatively, it’s the writer’s story. It’s the one I empathize with. But Mila (Kunis) plays a character who’s well meaning, but she’s always one step behind. She’s someone whom you can’t believe would do these things. I think she’s a character we all can identify with. And James (Franco’s) character, who is just so judgmental. He is unable to accept love and that’s what transforms him: the love of Loan (Chabanol), who plays his girlfriend. We just want someone to accept us with all our flaws, and how we can learn to accept ourselves and to forgive ourselves. You take someone like Maria (Bello’s) character, who is the exact flipside of Kim (Basinger’s) character. One damns someone for what has occurred and what accepts (the tragedy). Liam’s character can’t accept being accepted. Q: How many drafts did you create before you finalized the script? Q: Were you hesitant to use this format again of intersecting stories? Haggis: Yes, but it’s a very different film. Other filmmakers have done nothing but done this really well. “Crash” used a format where characters would literally bump into somebody else and then you’d follow them, so the connectivity was a bit obvious. Here, I wanted to take the challenge of setting it in three different cities so there was no way these characters could cross. So when things started happening that just couldn’t happen, I wanted to say, “So something’s happening that can’t physically happen, then what’s happening?” I was so influenced by the filmmakers of the ‘70s, especially the Europeans: Truffaut, Goddard, Antonioni, Fellini, who just told stories that we Americans weren’t used to. I wanted the audience to have en emotional experience with these characters. I wanted them to think, “I feel for these characters, but what’s with these three women?” and allow people to realize that these characters are leading him to something he doesn’t want to see. They’re all facets of what he’s struggling with, and how he’s rewriting his own life as he goes along. Q: Since you had worked with Liam Neeson on your previous film, did you write the part in this with him in mind? Q: How did you cast Mila Kunis as a maid? Haggis: I honestly didn’t think she could play this role, honest to God. We met, and I said to her, “You’re too beautiful. I don’t believe the only job you’re going to be able to get is a maid.” But we went to lunch and within 10 minutes she convinced me that she could. Her character wanted to hide because she was ashamed. After being a soap opera actress, going to work in a storefront would have been a big challenge. People would be talking about her and her famous husband, so they would be judging her. So being a maid was kind of perfect; she could hide from the world, because no one looks at maids. So she convinced me of that. Q: You dedicated this film to your father, Edward Haggis. Why? Haggis: This is my riskiest film yet. My father, early on, prompted me to take risks. I moved to Los Angeles (from Canada) when I was 21 to follow my dream. I didn’t go to film school. I barely made it through high school. I was a construction worker and I was writing theater in the wintertime. He believed in me to take a big risk. I’m not really happy unless I’m taking this kind of risk, and this was a risk. He turns 90 today. Q: Has he seen it? Haggis: Not yet. I’m going to show it to him when I go to Canada. Q: Do you still enjoy writing films that you don’t direct? Haggis: Sometimes you get lucky like with “Casino Royale.” They asked me if I wanted to write a Bond movie, and I said, “You realize that if I do this, I will destroy Bond forever.” That was just so much fun and something I never expected to be able to do. There already was a director on it and he chose me so there wasn’t a choice. Other times, you have to decide if this is a film I want to stay with for five years. That’s how long it takes to make a film, so it has to really intrigue me. Q: Do you prefer to write and direct or just write screenplays? Haggis: I’m interested in writing for others and directing other people’s scripts. I’ve haven’t yet directed anything I haven’t written. I’m toying with that right now. Q: You’ve written also for a videogame? Haggis: Yes, they called on me to write “Call of Duty: Modern Warfare 3.” It was so much fun because I had to write for a character that couldn’t speak and it’s from his point of view. So the challenge was to help them with the story. I just worked on that for a few weeks. They knew what they were doing. I just had to add character to that. Haggis: My youngest, James, is 16, and my eldest, Alyssa, is 35. Two marriages. I actually have three daughters.